..is some time off! That is probably top of my list after these first couple months of finally doing what I’ve always dreamed of doing! It has been exciting and terrifying, exhausting and exhilarating! The first month was very slow but then in the last few weeks, some orders started to come in and I did a few lovely Christmas markets. I also met some great new makers to add to the collection and it feels like it is starting to come together. I’m so proud of the collection and how well it all works as a whole! I’ve recently got back into reading every night before bed to help me switch off and I’m so glad I have. As a kid I used to devour books and read non-stop and I’d forgotten how much I love losing myself in a good book. On my Christmas wishlist this year are 2 beautiful books. The first one is for doing not just reading and makes a great gift for all craft-lovers – “Making Winter” by Emma Mitchell. The second is a book that I want for myself and that I want to give it to anyone and everyone I know! The Lost Words by Robert Macfarlane and illustrated by Jackie Morris is a beautiful ode to nature and the words that are fast disappearing. “All over the country, there are words disappearing from children’s lives. These are the words of the natural world – Dandelion, Otter, Bramble and Acorn, all gone. The rich landscape of wild imagination and wild play is rapidly fading from our children’s minds.” It’s a celebration of nature with magical poems and gorgeous hand-painted illustrations. I buy my books from Hive.co.uk, an online bookshop that supports the high street book shops or from the publishers directly, or from Daunt books if I’m in London. I will be stocking the Lost Words books in the next week or so as I love it so much. I would also love this beautiful loop scarf by Sian O’Doherty, handmade in Wales. I’m hoping I can add both these things to the These Two Hands collection one day. I love snuggling on the sofa with my baby girl under a blanket and recently discovered Atlantic Blankets in Cornwall who make beautiful blankets in nature inspired colours. I would love one of their Sea Green Herringbone blankets and I’m hoping to stock them in 2018 too. I’m addicted to learning new crafts and makers workshops! The These Two Hands name was originally going to be a blog about my attempts at learning to make things and not being very good at it, but having lots of fun trying. I love giving and receiving experiences rather than stuff. I’ve been given craft workshops, cabinet upcycling workshops and cookery courses as gifts and I’ve given jewellery-making and pottery courses to two close friends in the last few months too. One of the best courses I’ve ever done was a pottery course with Wendy Calder, the maker of the beautiful coffee cups and jugs on my website. I did one in the autumn and I’m planning on another one next year. I love outdoor workshops and was lucky enough to do a fantastic willow sculpture workshop at Zantium Studios in the Peak District for my birthday earlier in the year too which was a great day in a beautiful location. Here in Bristol, the Bristol Folk House does lots of great arts and craft courses (I’ll be doing the cyanotype printing one again this year!) and really near me is Flora Arbuthnott, creator of Wild Dye Garden, who has a wild dye garden where she grows plants to make natural dyes herself and runs natural dye workshops – I’ve done the shibori dyeing and the bundle scarf dyeing workshops and they were both amazing! Through launching These Two Hands and finally joining the world of Instagram, I have discovered so many great people and companies doing amazing things that I am inspired by, hope to learn from and want to share. 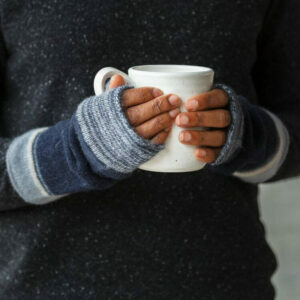 There are too many to list here but the ones that I really love and that I hope to visit in person one day are Midgley Green in Clevedon, &Hobbs in the Surrey Hills … I also love the collection and ethos of Decorators Notebook which is an online range of ethical homeware by artisans around the globe. And to get out and meet makers, my favourite place is the monthly Frome Independent artisan market that takes over the entire town – I met a few of the makers i work with there and it’s the perfect place to pick up unique handcrafted gifts.